An extremely useful tool for fixing harsh-sounding audio with a few excellent tricks up its sleeve. Effectively removes harshness from mixes and individual instruments. Simple yet very effective operation. Doesn't affect the dynamics. 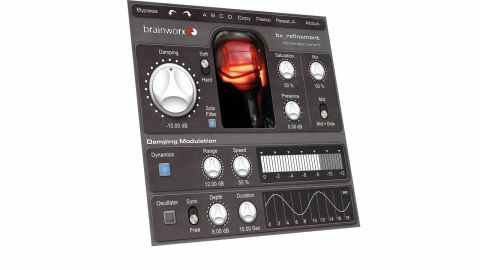 Bx_refinement is a plugin specifically designed to remove the harsher elements of digital tracks and mixes without radically altering the overall character of the sound. While the digital age has given us many wonderful advantages in audio production, the move away from pure analogue recording has had its pitfalls. One of the major issues is that, due to digital's unforgiving nature mixes, can develop harsh edges that are then exacerbated by the insatiable desire for 'loudness'. It's no surprise that there are so many audio products out there that have 'analogue warmth' as a major selling point. However, as the bulk of audio production, and certainly the mix process, tends to be mostly or exclusively digital, those brittle edges are often there and difficult to remove without compromising the overall vision of the mix. "We tried refinement on a variety of sources and mixes and it really does do what it claims"
Enter bx_refinement. The core process in the plugin is based around a dynamic peak band EQ whose principal control is the large 'damping' knob. This sets the level of reduction and can be further adjusted using the soft/hard switch to its upper right which changes the character of the processing. To the right of the central tube graphic sit four further controls. Saturation introduces a small amount of tube-like distortion into the mix while Presence adds a degree of high-end sheen should the sound need it. Mix balances between affected and unaffected signal and the mid/side switch places the processing either across the stereo image or exclusively in the centre. Below all this sits the damping modulation section, which is split into two parts. The dynamics section has a range control which sets the threshold at which the damping activates, and speed is like a release control, so effectively working a little like a frequency sensitive compressor. Oscillator has a depth control and a duration (speed) control and can be set to sync with the DAW tempo. The waveform can be moved against the grid in sync mode so you can set where the damping is most effective. We tried refinement on a variety of sources and mixes and it really does do what it claims. Aggressive peaks in drums were reduced by bringing dynamics into play, scratchy synths sounded warmer and fatter and a hard-edged bass guitar sat back into the mix without losing any of its drive and presence. In fact, on problematic individual sounds refinement makes it much simpler to sit them in the mix effectively, making the whole track sound bigger and richer. On whole mixes subtle amounts of damping, saturation, presence and dynamics had a very profound effect on the overall sound without losing any of the character or dynamic impact. The oscillator can make some great tremolo effects on individual sounds and, when synced and cranked up a bit, it can give a very effective side-chaining effect without the associated 'pumping' which compression can bring. All in all, this is a great tool, which quickly and effectively solves a slew of problems that can normally take a long time to deal with. Great stuff.